A wondrous 600 year old church, the Eglise Notre Dame is an impressive monument, symbolizing the glory of Calais. 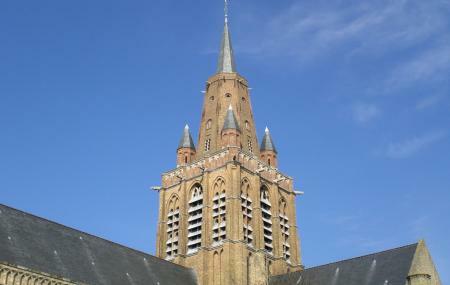 The construction began in 13th century by Flemish masons and architects. It continued even during the English occupation in 14th century when English architects took over the construction and again it lasted for about a hundred years. It was finally completed in 1691. Also Charles de Gaulle and Yvonne Vendroux were married in the church in 1921. Its interiors are adorned with statues of Angels, Charlemagne, St Louis, The Virgin Ink and also a painting ‘Descent form the cross’ by the artist Peter Reubens. With its distinctively looking Tudor architecture, it’s the only English styled church in France. Since its heavy damage during WWII it is only recently that its renovations have completed and is open for tourists. Located in a by lane, Rue de la Paix, from Rue Royale. Nearest Bus Stop: Rue Royale, Lines: 12. How popular is Eglise Notre-dame? People normally club together Parc Richelieu and Calais Lighthouse while planning their visit to Eglise Notre-dame.